This chapter describes the formulation of multiphase continuum models for gas-solids flows with chemical reactions. A typical formulation of the equations is presented here, following the equations in the open-source software MFIX (http://mfix.netl.doe.gov) so that interested users may look up details of the numerical implementation, study the solutions, or experiment with the numerical implementation of alternative formulations. 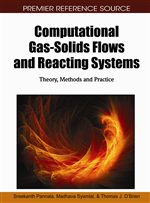 The authors will first provide a brief overview of the significance of gas-solids reacting flows and the challenges in modeling these systems along with various efforts undertaken by different groups over the last 2–3 decades. They will then summarize the methods used to derive multiphase continuum models and to formulate constitutive equations. They will later provide information on the formulation for mass, momentum, granular energy, energy, and species balance equations for gas and multiple solids phases. They will discuss the constitutive equations required in each of the balance equations; a detailed discussion of certain constitutive equations, such as the gas-solids drag and granular stresses (derived from kinetic theory), will be presented by other authors in later chapters. The authors will point out the differences between different approaches and direct the reader to references that discuss those approaches in detail. They will end the chapter with the example problem of the simulation of a bubbling fluidized bed to illustrate some of the modeling options — physical models, numerical discretization schemes, and grid resolution – that need to be considered to accurately simulate gas-solids systems. Gas-solids reactors, which are critical components in many energy and chemical conversion processes, cannot be designed reliably using correlation-based scale-up methods, and a physics-based method is needed for increasing the reliability of the design. There are many examples: coal gasifiers that react coal with oxygen and steam to produce synthesis gas (syngas)—a mixture of hydrogen and carbon monoxide; circulating fluidized-bed combustors that burn coal to generate heat and electric power; or fluid catalytic cracking (FCC) risers that crack heavy oil with the help of hot catalyst particles, producing light hydrocarbons such as gasoline. Increasing the conversion of the reactants (e.g., coal in a gasifier) or improving the selectivity of the products (e.g., gasoline in FCC) or ensuring the reliability of the reactors or reducing the size of the reactors are design objectives that would help increase the profitability of existing processes or ensure the economic viability of a novel process. For example, reliability is the single most important technical limitation to be overcome to enable widespread deployment of gasification technology (Clayton, Stiegel, & Wimer, 2002). For the rapid development of post-combustion CO2 capture technology, solid-sorbent based fluidized bed reactors need to be designed to reduce capital cost and energy consumption (Ciferno, Fout, Jones, & Murphy, 2009). The design of such gas-solids reactors currently relies on data from laboratory-scale batch reactors or continuous pilot-scale units. Although many processes have been successfully scaled-up in this manner, some notable failures have occurred (Krambeck, Avidan, Lee, & Lo, 1987; Squires, Kwauk, & Avidan, 1985). The hydrodynamic behavior of laboratory-scale units could be different from commercial-scale units that are 20–100 times larger, making scale up that involves large size changes unreliable. Reducing the uncertainty by building and testing pilot-scale units at several intermediate scales is both expensive and time consuming. In spite of the decades of empirical experience, scale up of fluidized-bed reactors and transfer systems is even today characterized as “not an exact science” and as a “daunting task” by engineers well versed in the design of such systems (Karri & Knowlton, 2005). A physics-based approach, multiphase computational fluid dynamic (CFD) modeling, that has emerged during the last three decades is rapidly gaining acceptance as a tool for designing, scaling up, and trouble-shooting gas-solids devices and reactors.